Known by many common names including Sweet Flag and Bitterroot, Calamus is a plant that has long been revered by Europeans, Asians and Native Americans alike for his many uses. Calamus has a history of use all around the world. The Mongolians believed Calamus to purify water so they traveled with it, planting it in their water sources wherever they roamed. Because of this, Calamus was given the name Mongolian Poison and the people avoided any water found with Calamus growing in the water, fearing the Mongolians had planted the plant there to poison their water supply. Many years later people began to realize the value of the plant. 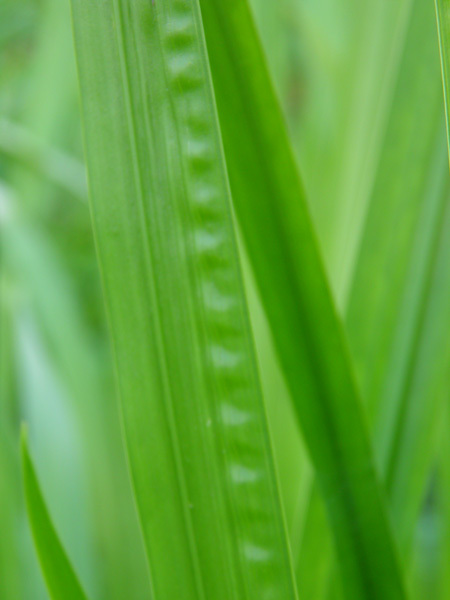 This beautiful reed-like plant loves to grow in moist, damp, watery places and is often found growing among Iris, Cattail and other water loving plants. 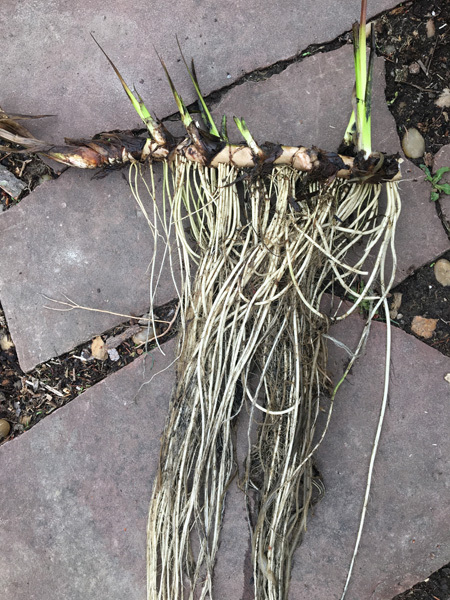 I have successfully grown Calamus in a dry area but found that he was more easily overgrown by other land loving plants and while he can hold his ground, does much better with his rhizomes in water. Energetically, Calamus is considered to be bitter, pungent, acrid, warming and drying. Typically the rhizome is used for medicine but the leaf has some uses as well. While this plant can be extracted, it is most often used by chewing or sucking on a bit of the rhizome or through cold water infusions. 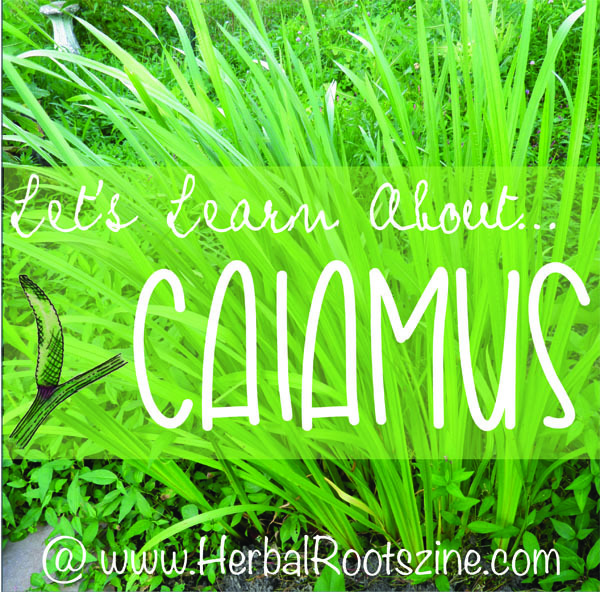 Nutritionally, Calamus has calcium, choline, magnesium, phosphorus, potassium and zinc. Calamus contains many constituents. He contains the amines choline, methylamine, dimethylamine, and trimethylamine, tannins, resin, acoric acid, palmitic acid, and the bitter principle acorin. In addition, Calamus contains many volatile oils: calamenol, calamene, calamone, eugenol, methyleugenol, and the sesquiterpenes acolamone, acoragermacrone and isoacolamone. 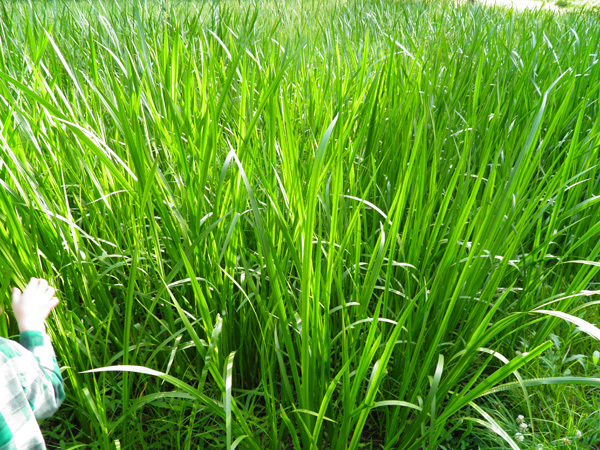 In addition, the Indian Acorus calamus contains large amounts of beta-Asarone, while the European variation contains small amounts and the American variation contains little to none. Some lab tests on rodents have indicated in the past that this volatile oil is cancerous which prompted the FDA to consider Calamus to be an ‘unsafe herb’ and its use is prohibited in food. Interestingly enough, the Council of Europe lists Calamus as a category N3 source of natural food flavoring in the traditional manner. Medicinally, Calamus is analgesic, antibacterial, anticatarrhal, antihistamine, antispasmodic, antitussive, aromatic, astringent, bitter, brain tonic, carminative, central nervous system stimulant, decongestant, demulcent, diaphoretic, digestive, emetic, emmenagogue, expectorant, febrifuge, hypoglycemic, hypotensive, laxative, nervine, rejuvenative, relaxant, spleen tonic, stimulant, tonic, vasodilator, and vulnerary. As an aromatic, bitter, carminative, digestive, laxative tonic, Calamus helps with a variety of digestive related issues including indigestion, dyspepsia, heart burn (often described as burning water rising from the stomach up into the throat), lack of appetite, dry mouth, bad breath, gas, bloating, cramping, colic, constipation, gastritis, nausea and gastric ulcers. Calamus works well mixed with Marshmallow for assisting with digestive issues. Combining his digestive uses with his anti-anxiety actions, Calamus is useful for helping individuals address anorexia, making him an important part of a protocol to overcome this eating disorder. A word of caution though, even though Calamus can be used for nausea, if too much Calamus is used at once, he becomes emetic and can induce vomiting. Even chewing on too much root can cause nausea to occur so be sure to start out small on your usage. Calamus is also supportive of a healthy respiratory system. He is astringent, anticatarrhal, antibacterial (some say antimicrobial), antitussive, decongestant, and expectorant, assisting with a variety of respiratory ailments such as congested sinuses, bronchitis, asthma, chronic catarrh, rhinitis, and laryngitis. 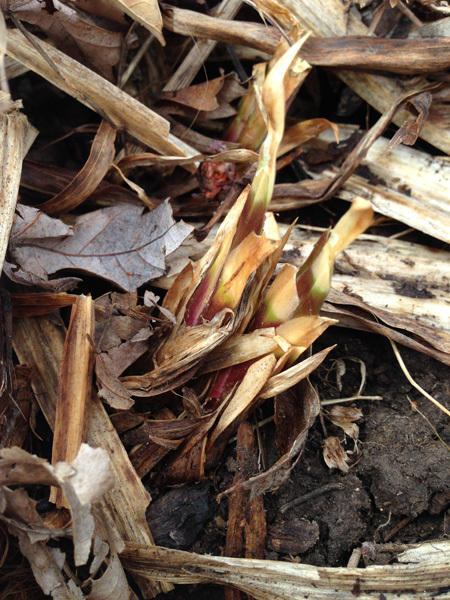 As a warming and drying herb, Calamus is especially helpful for resolving cold, damp lung issues. Calamus is often used by speakers, singers and other vocal supporters to strengthen the voice, increase the range and help a person to continue talking longer. This should be used with caution, however, as the vocal chords could become strained or injured if it is used too much. 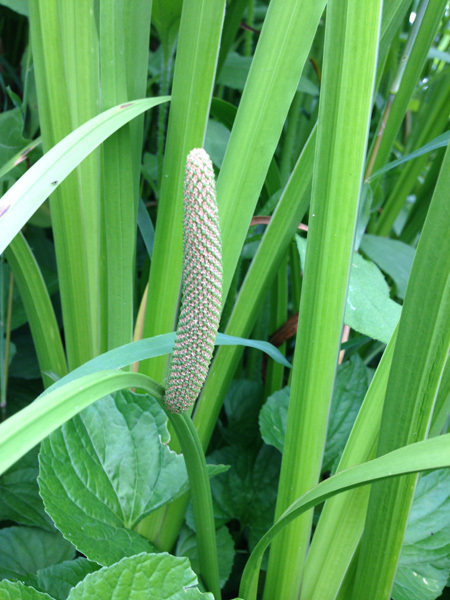 Traditionally, Calamus was used by Native Americans as a tea or decoction for liver, gallbladder, bladder, and kidney issues, including stones. Today we still use it for these issues as well. Turning to the nervous system, we can see that Calamus’ listed actions are a central nervous system stimulant and a nervine. Calamus is great for increasing our attention, especially if we have spent a lot of time trying to focus and study. 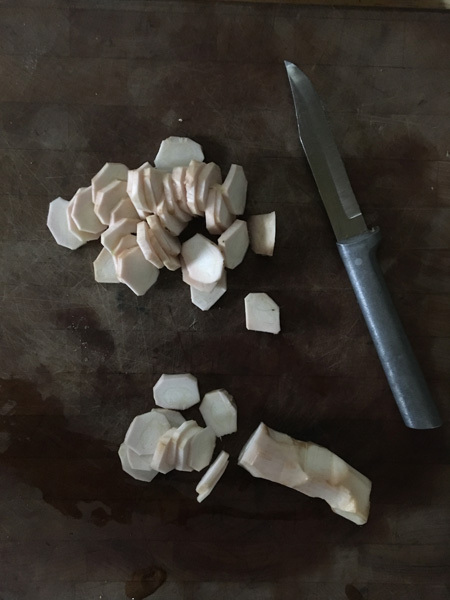 For those who have suffered from brain damage, stroke or head trauma, Calamus has often been helpful in restoring neurological function during recovery. Calamus has also been found to be helpful with those who have autism. Calamus is great for those suffering from anxiety issues. For post traumatic stress disorder, Calamus assists in bringing the sufferer back to the present which can be helpful for warding off various feelings of anxiety and panic, fear, and nausea. At the same time, Calamus is helpful for other types of nausea, including motion sickness. Externally, Calamus can be poulticed for animal bites, bruising, wounds, skin blemishes and eruptions, rheumatism and gout. 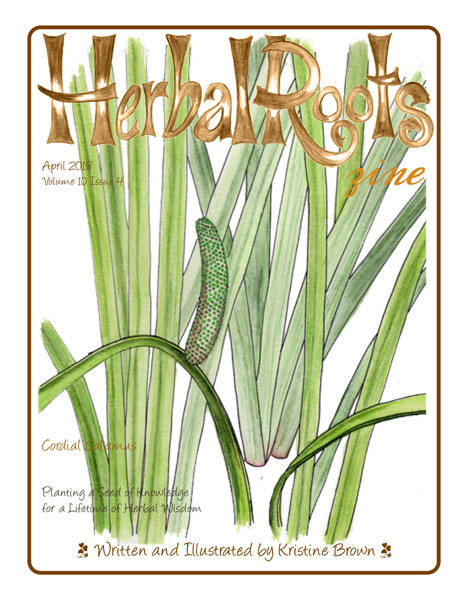 Learn more about Calamus through the April 2018 issue of Herbal Roots zine. It’s on sale through the end of April. This entry was written on April 3rd, 2018 by KristineBrown and filed under Uncategorized.